How to present yourself and your company attractively in the progressive web app? 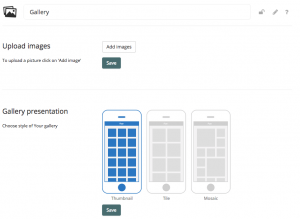 Present yourself and your company, add photos and references with this module. Click on the button add picture and upload your pictures. Confirm this with the save button. Then you can choose how the images should be displayed in your pwa. You can choose between the thumbnail, tile and mosaic view. And don’t forget to accept the settings with the save button.